The HSC-300R incorporates digital triax technology and is equipped with sophisticated 16-bit A/D conversion circuitry as well as superb three 2/3-inch CCDs to bring out a high level of picture quality over conventional digital triax infrastructures. The camera also has a built-in high-quality down-convertor for superior SD images, as standard. It also incorporates Neutral Density (ND) and Colour Correction (CC) optical servo filter units. 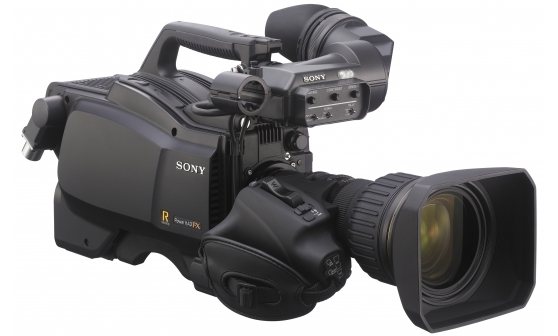 Sony also offers large-lens operation with the HSC-300R in combination with the HDLA-1500 Series Large Lens Adaptors, which have been widely accepted for operation with Sony’s flagship model HDC-series camera. These Lens adaptors, featuring a unique “Quick Mount” design, help to maximise the operability of the camera. The HSC-300R offers flexible configuration with the highly compact 1.5 RU-size HSCU-300R Camera Control Unit. The HSC Series camera is equipped with field-proven 2/3-inch type full-resolution 1920 x 1080 CCDs. Due to Sony’s advanced sensor technologies, the CCD imager offers a high sensitivity of F10 for 59.94 Hz and F11 for 50 Hz with a remarkable signal-to-noise ratio (S/N) of -60 dB (HD) for high-quality pictures in all kinds of demanding shooting environments. The HSC Series camera incorporates a high-performance 16-bit A/D converter with the latest technologies that enables captured images to be processed with maximum precision. Also, the Auto Lens Aberration Compensation function can optimise lens performance to provide stunning picture quality. Digital Extender function expands the size of the image by a factor of 2 in the centre of captured images by the image sensor. This function works without decrease in sensitivity, such as F-number drop, which occurs by the use of conventional optical extender functions. The ALAC2 function automatically reduces lens chromatic aberration by both horizontal and vertical compensation when a lens supporting ALAC2 function is attached. The HSC Series camera provides a wide range of inputs and outputs via the connector panel such as HD-SDI output, SD-SDI output, VF signal, return signal, and SDI Prompter signal. An intercom channel (ENG/PROD) is also provided. The HSC-300R utilises a very high-quality digital triax system that expands its operability in field applications, as well as for studio production. This digital triax system can be integrated into conventional triax-based infrastructures, enabling an easy upgrade from existing systems. The latest digital triax transmission system offers long cable runs of up to 1800 m (5904 feet)* via ø14.5 mm cable between the camera and the HSCU-300R. * The maximum cable length depends on the camera system configuration, lens type, and the number of cable connections. The highly versatile HDLA-1500, HDLA-1505, and HDLA-1507 Large Lens Adaptors are also available for the HSC-300R. These adaptors allow the camera to be used for many different production applications and for users to choose the optimum viewfinder for the shooting condition. This capability makes the HSC-300R the most flexible portable camera in its class. Installing the HDLA-1500/1505/1507 Large Lens Adaptor is very simple and eliminates time-consuming adjustments such as lens centring or additional wiring. The HSC Series camera offers flexible configuration with the highly compact 1.5 RU-size HSCU-300R and HSCU-300RF Camera Control Units, creating a standardised 19-inch rack system that is ideal for space-limited production areas. When the front panel of the HSCU-300R or HSCU-300RF is replaced with the optional CCU Front Control Panel HKCU-FP2, a simple remote control system can be configured. Many functions of the camera can be controlled by the control knobs and switches on the HKCU-FP2. Furthermore, when the optional HZCU-MC3 camera operating software is installed, the HSCU-300R and HSCU-300RF allow the HSC-300R/100R and HSC-300RF/100RF respectively to be controlled by an MSU-1000/1500 Master Setup Unit or RCP-1000 series Remote Control Unit, enabling the camera to be used as a simple studio system or as part of a large-scale broadcasting system consisting of multiple cameras. The position of the shoulder pad can be adjusted – either forwards or backwards – to provide users with the optimum weight balance. This is particularly useful when the camera is docked with any type of lens or camera adaptor. In addition, no tool is required for this adjustment. Viewfinder Detail: adds dedicated image-enhancing edge signals directly to the viewfinder for a camera operator to recognise a focusing point. Focus Assist Indicator: displays an indicator for adjustment at the bottom or other position of the viewfinder frame. It’s beneficial especially when shooting by wide-viewing angle. The designed carrying handle enhances the camera’s operability. A protrusion positioned on the front of the handle enables users to hold the camera with added stability while shooting. In addition, the non-slip structure of its lower surface helps users to grasp the handle firmly. The HSC-300R camera is equipped with Neutral Density (ND) and Colour Correction (CC) optical servo filter units, which can be remotely controlled from a remote control panel (RCP) or a master setup unit (MSU). The HSC Series camera has dedicated ‘assignable switches’ available for frequently used functions. Located on both the side and rear panels, these switches allow functions such as electronic colour-temperature conversion to be assigned as required. Buttons on the handle are also available as function-assignable switches. All of these switches greatly enhance the camera’s operational convenience. The camera is equipped with a built-in high-quality down-convertor for superior SD images, as standard. In addition to artistic and skilful lighting, in-camera gamma setting plays an important role in dealing with contrast range and giving a specific “look” to an image. In order to meet a broad array of customer demands, seven types of standard-gamma and four types of hyper-gamma tables are provided. HyperGamma is a set of new transfer functions designed to provide powerful contrast handling by making maximum use of the capacity and wide dynamic range of the CCD sensor. These functions are quickly accessed via the set-up menu, and camera operators can select one curve from a choice of four that best suits their needs and conditions. For example, they can select to enhance natural reproduction in low-key areas to achieve greater flexibility in wide dynamic scenes. The multi-matrix function of the HSC Series cameras allows colour adjustments to be applied over the colour range specified by the operator. The colour spectrum is divided into 16 areas of adjustment, where the hue and/or saturation of each area can be modified. This function is especially useful when only the hue of certain colours needs to be adjusted for special-effects work. Multi-matrix is extremely effective for capturing images with similar colour tone in a system configured with existing SD cameras or other models of camera. This function enables the picture from another model of camera to be easily matched. The Master White Gain function of the HSC Series of cameras enables step-less adjustment of gain levels. This makes it possible to adjust the gain level more precisely compared to conventional stepwise adjustment.